Tony Kushner has proven that rarest of beasts among playwrights, a superbly inventive writer who, with poetic grandeur, is able to straddle the abyss between the domestic and the global. His is an implicitly political voice, yet one that mostly avoids the pitfalls of preachiness through the sheer humanity of the characters and the relationships he crafts. In Kushner’s world, everyone is on the edge of a cosmic precipice, and in Homebody/Kabul, he has sought to apprehend the expansive history of Afghanistan and its people, a vital trade hub and target of conquest across countless centuries. It is a city that has been invaded by all yet conquered by none, and one the West has now found itself very much concerned with. Homebody/Kabul is really a play in two parts – Homebody, an hour long monologue detailing a London woman’s fascination with the ancient heart of Afghanistan, and her quest to purchase Afghan hats for a party – and Kabul, the main body of the drama, where an Englishman lands in the eponymous city with his daughter in a desperate search for his wife, who has apparently been killed and mutilated by unknown assailants in a country under the rule of the oppressive Taliban regime. Homebody has been widely hailed as a nigh perfect monologue, and it is interesting to note that while it could withstand being performed in isolation, Kabul would lose a great deal in its absence. Jane Nolan as the Homebody is simply superb, her challenging monologue delivered with a wonderfully disarming neurosis. It is a transporting performance, cumulative in its magic. The Homebody’s fantasia is credible, her passion for history authentic, her slight elliptical madness deftly handled. She invites us to share her inner secrets, waxes lyrical about the ancient world of empire and dust, details the difficulties of her married life, relates her dream encounter with an Afghan shopkeeper, all in a strange and enchanting dance between the private and the public worlds. ‘The private is gone,’ she says. ‘All must be touched. All touch corrupts.’ It is a lament for the forgotten world of the past, the hidden magic of unknown lands, and is filled with a brittle yearning. 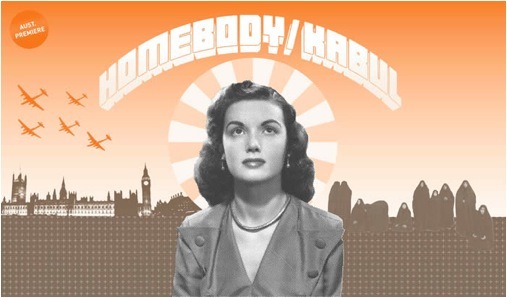 The second part of Homebody/Kabul opens with an Afghan doctor and a severe mullah (Osamah Sami) relating the details of an English woman’s mutilation to her husband Milton, played by Ernie Gray, and their daughter Priscilla, Shelly Lauman. Quango Twistleton, a former NGO delegate, is present to assist in their investigation. But her body is nowhere to be found – all that remains is her Sony Discman – and there remains the hope that the stranger in a strange land has survived somehow. From there, the play winds through the labyrinths of cultural misapprehension, disguised agendas and the fog of language, occasionally threatening to collapse in on itself yet never ceasing to hold the attention. While Milton fortifies himself with scotch in their scummy room, succumbing to the fear of the unknown, Priscilla dons a burqa, determined to connect the dots of her mother’s disappearance. She is aided in her search by Khwaja, an accomplished poet who writes only in Esperanto, and finds herself drawn into the shifting sands of intercultural conflict and political intrigue. A scene where she stands over the city and is moved by the beauty of the broken city, devastated by recent US missile strikes, is a powerful reminder that the past is always being destroyed by the relentless march towards the future. The direction is clear; Chris Bendall has kept design to the bare minimum, allowing the language to lift and carry the audience through a very challenging work. In terms of performance, we see an eminently capable ensemble that has risen to Kushner’s vision. Tyler Coppin is a treat as the elegantly wasted Quango, who finds Afghanistan a perfect home for a dissident junkie. Majid Shokor is alternately charming, funny, and deeply sorrowful in a beautiful performance as the Tajik guide Khwaja. Ernie Gray and Shelly Lauman are assured in their roles and share a believable relationship as father and daughter, and Milton’s flirtation with opium provides much-needed levity. Osamah Sami borders on terrifying as the mullah, his intensity channelled with maximum effectiveness. Shahin Shafaei achieves a beautiful truth as a shopkeeper transported by the music of Frank Sinatra, and in a dazzling display of multilingual pyrotechnics Wahibe Moussa commands the ear as Mahala and the Afghan Woman. It is the work of professionals; confident and proficient, and if a flaw is to be found at all, it is that occasionally the intensity of certain passages saw a sacrifice in the clarity of speaking, as though the actors looked set to all but fall of the cliffs of such heightened text: even so, this only seemed to occur towards the last quarter of a three and a half hour show, delivered in a very hot space, and can be forgiven. Homebody/Kabul occupies an interesting position in Kushner’s oeuvre. Written before the events of September 11, 2001, it foreshadowed in many ways the cataclysmic changes that that event instigated in a fashion that has been described as ‘eerily prescient’. This is no great surprise, given the prophetic strain in which this writer excels. It is perhaps too long, and a final encounter between Priscilla and the Afghan refugee overextends things somewhat where the prior scene would have left a resounding ending. Even so, with Homebody/Kabul, Kushner has achieved far more than its successor Bright Room Called Day, which seems unusually clunky in its commentary, and just a little less than the masterful Angels in America, which flows like refined oil. With their accomplished production of Homebody/Kabul in its Australian premiere, Theatre@Risk has demonstrated that the most provocative and engaging theatre is often to be found just to the left of the beaten track.